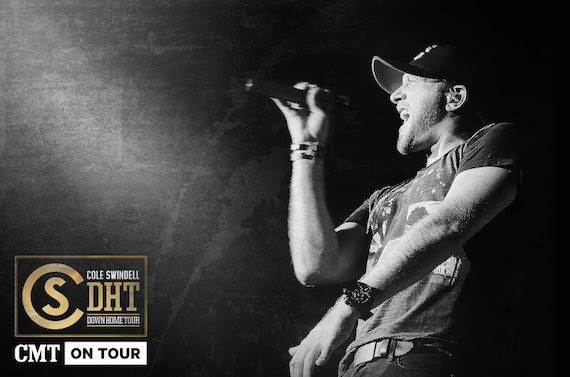 Cole Swindell has partnered with CMT On Tour for his third annual Down Home Tour, which will again be paired with the release of a collection of new music. The 2016 outing will be billed as CMT On Tour Presents Cole Swindell Down Home Tour. This 17-date headlining tour will launch Oct. 26 at Cain’s Ballroom in Tulsa, Oklahoma, and will run through Dec. 16 at Greenville, South Carolina’s Blind Horse Saloon. More tour dates will be added soon. Various dates will feature openers Cole Taylor, Travis Denning, and Jon Langston. As with Swindell’s previous Down Home tours, a new collection of music will be released in conjunction with the outing. Down Home Sessions III EP will release digitally on Oct. 28 via Warner Bros./Warner Music Nashville. This marks the 15th annual tour for CMT. CMT On Tour launched in 2002, and has included artists such as Miranda Lambert, Trace Adkins, Bryan, Keith Urban, Brett Eldredge, Thomas Rhett, and more.